The “Work and Travel Cyprus” programme is designed for all EU citizens till 29 years old (students and non-students) seeking to obtain international work experience to enhance their CV, or just looking for an exciting working holiday adventure by the Mediterranean Sea. Till 15th of February total programme cost is only 345 EUR! Apply until 15 of february and save 50 EUR! 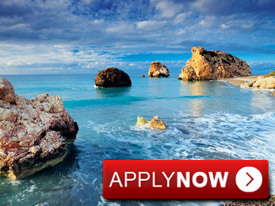 We offer work placements in hotels and restaurants in Cyprus. The placements are available in the hospitality industry for a minimum of 3 months. All the positions include accommodation and meals provided by the employer unless specified otherwise. Work placements are located in beautiful areas close to the sea. Most popular positions: waitress, barwoman, chambermaids, receptionist, ktichen helper. Type of job	 Work placements in hotels and restaurants. Salary (other benefits)	 Candidates will earn €500-800 plus tips. Accommodation Accommodation and meals provided by the employer. Location of job placement Various Cyprus places. Duration of the placement	 Minimum of 3 months. When to apply? The programme is available all year round. Visa Required	 EU citizens do not need entry visas or work permits for Cyprus. These are all paid positions and candidates will earn €500-800 plus tips.